this entry covers the four issues of the “Spartan : Warrior Spirit” mini-series. I’m gonna be honest, I didn’t like this book when I was a kid. I didn’t like it two years ago when putting the chronology together for this website/blog. But I have to admit, I didn’t find it too bad going back to this time around. Not sure what changed. I’d always been a fan of Busiek, so there was no “later in life appreciation” or anything. Maybe it was just a case of lowered expectations. Or it is a good book and I couldn’t see past the art, because while fine for a regular book, we’re talking about a WildStorm/Image book, they’re supposed to be a bit flashier than this, right? The story opens up with four of Spartan’s spare bodies waking up at the HALO building and flying off, cut to the WildC.A.T.s in the middle of a Daemonite battle, one in which Spartan is sacrificed. Lucky for us this means there won’t be a “but who’s the real Spartan” showdown later with Cole pointing a gun at both as he keeps switching which one he’ll pull the trigger on. The team is dismayed to get home and see the bodies are gone and they can’t reboot their team leader, pal and part-time lover. When Spartan does wake up he finds himself in a small Tibetan village in the Alps. He’s being woken up by Dr. Able and the doctor’s daughter Allison, who is supposedly Spartan’s wife. Spartan doesn’t remember all of this, but once a Gamorran Hunter-Killer breaks into the base he remembers how to fight. This is all that Dr. Able really wants Spartan for, to fight off the Gamorrans as they continue to come after his scientific research base built into a Tibetan temple. What is Dr. Able up to? Well, legend has it that an ancient evil was trapped deep underground long ago, and the temple was built on that spot. Dr. Able wants to bring this evil presence back out and into the world, but this time trap it in his computers so that he can control its evil energy. Not that any of this is easy for Dr. Able to do. Mostly because Hunter-Killers from Gamorra keep crashing the gates. Why? Oh, because up until recently Dr. Able was working with the Gamorrans. He was even the creator of the Hadrian-7 android, which is the kind of machine Spartan is, and he tells Spartan to think of him as his dad. So, Spartan’s pop is basically chaotic neutral and Spartan married his own sister? Anyway, because Dr. Able backed out of his deal with the Gamorrans, Kaizen Gamorra keeps sending wave after wave of Hunter-Killers to either confiscate the research, kill Dr. Able or both. Meanwhile, Spartan is growing frustrated that he can’t remember his life, but can remember how he’s an awesome team leader. Turns out Dr. Able tried to shield all that information from Spartan by way of memory wipes to the ole computer brain. After all, he just needed Spartan for defense purposes. Some images of his past life do come through on occasion, but nothing ever sticks long enough to make a lasting impression. Eventually, the rest of the WildC.A.T.s team locate Spartan and go to get him. They meet a bit of resistance at first, as Spartan has no real idea who they are, and has been told they are mercenary bandits after Dr. Able. Dr. Able convinces Spartan of their “no-good-ness” when he tells them the WildC.A.T.s were responsible for inserting an override chip in his circuitry. Spartan eventually snaps out this falsehood just in time for the ancient evil to escape Dr. Able’s computer system and infect the doctor himself. Spartan, of course, saves the day and confronts Marlowe about the override chip. Marlowe admits it was for safety, but confesses it had never been used and promises Spartan there will be none in the future. Then everyone flys home. Happy ending. This book came out quite a bit later than you’d think. 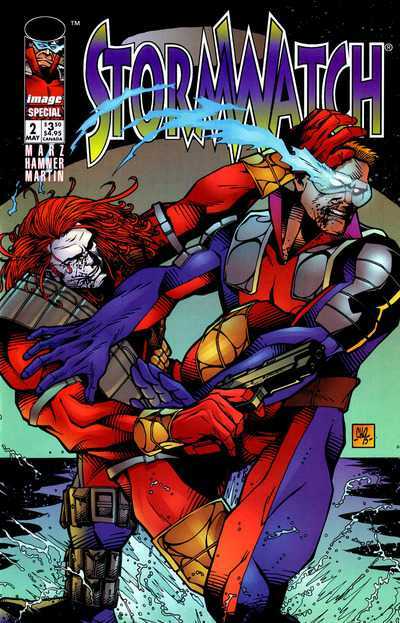 It was actually published after “WildStorm Rising” so it was odd to see a story with Spartan and the old WildC.A.T.s as he was leading StormWatch and the rest of the team was presumed dead/in space. Falling where it does in continuity here gives us our first look at Hunter-Killers as well as Kaizen Gamorra. This is Kaizen as we’ll never see him again. Pudgy, cyborgian and of green skin. It almost makes more sense for it to be the first we see of him, as comics retcon small first appearances like this all the time. Also, it’s a flashback that could be old enough that Kaizen could’ve looked like that… I mean considering at this time we’re still not talking about the real Kaizen Gamorra. We all know that fake one had a lot of work done! More on this ridiculous WildStorm plot point in the “Fire from Heaven” cross-over. In this story, the features for the Hadrian robots were said to be based on a man named Zachary Krieger. We also know just about everything that Dr. Able says is a lie, but his daughter seems to back at least that story up. We’ll soon find that Spartan’s look was more or less based on John Cole’s. Also, there’s an off-handed remark that Spartan’s face is wrong by Pris, even though it’s drawn pretty much the same as when the bodies woke up at the HALO building and flew off, as well as when the then active Spartan who perished in the opening fight. This is like that “disguise” that Taboo cooked up for Backlash isn’t it? 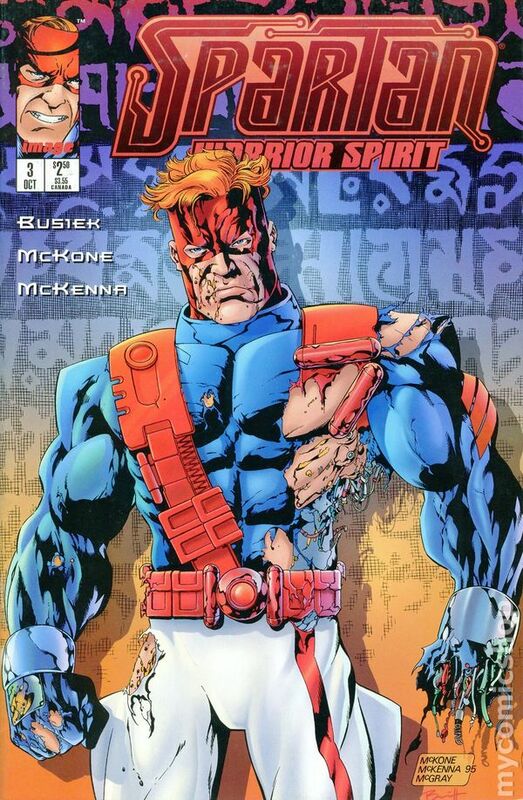 The first time we ever got any information on Spartan’s backstory, and how he was from Gamorra was in “WildC.A.T.s” vol. 1 issue 6 where Marlowe and Jules just acquired the Hadrian-7 tech shortly before finding Warblade washed up on the beach. I’d like to imagine that the battle we meet the WildC.A.T.s in the middle of was the one that Void, Pris and Zealot were running off to join at the end of the “Zealot” mini-series. Also, that battle featured the words “Daemonites splinter group.” This is at least the second time we’ve seen that phrase. 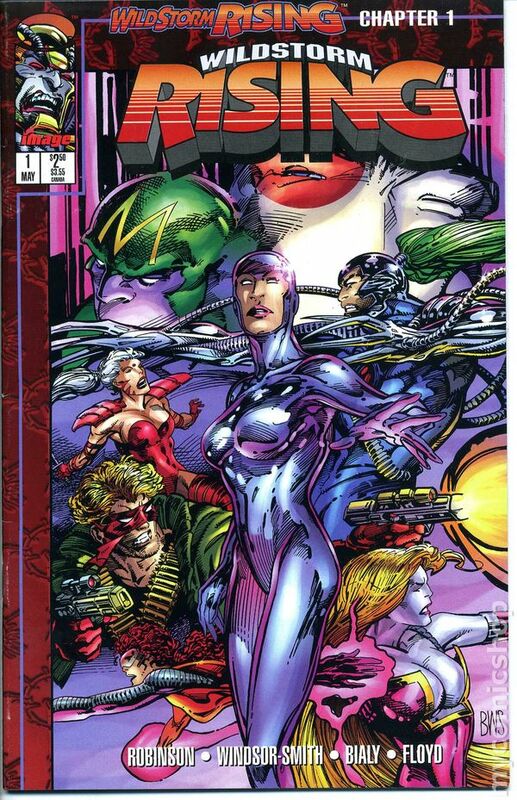 The last was in “WildC.A.T.s” vol. 1 issue 14, and I’m wondering “a splinter from what? Daemonites are Daemonites!” Maybe a splinter group from The Cabal, perhaps? Seeing that the team was fighting Hybridroids would suggest that Hightower might’ve been behind this evil plot. Oh, said evil plot was Daemonites taking over the bodies of the children of influential world leaders so that in a generation the Daemonites would be in charge. Holy heck, that’s a hell of a good plan! NEXT : “StormWatch” Vol. 1 issues 11 – 14 by Ron Marz, Mat Broome, Joe Phillips, Trevor Scott, Jason P. Martin and Karl C. Story.